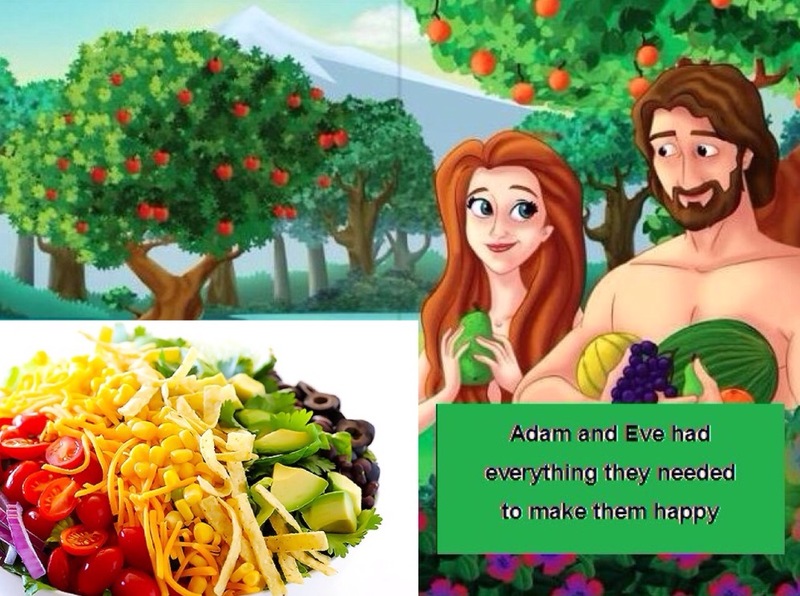 LOMA LINDA, Calif. --- A team of Seventh-day Adventist researchers from the church's Geoscience Research Institute has discovered what they say is "conclusive evidence that Adam and Eve ate haystacks in the Garden of Eden." The findings come out of a five-year interdisciplinary study of what GRI spokesperson Sal Saah described as "culinary clues in ancient manuscripts of the Genesis account, as well as carbon-dated ancient eating instruments from where the Tigris and Euphrates rivers run into the sea in modern-day Iraq---the suspected site of Eden." The most compelling piece of evidence was the discovery of nearby 6,000-year old cave paintings of a beautiful couple sharing a dairy-free version of what we now call 'haystacks' under the shade of a fruit tree, said Saah. Saah was careful to point out that his team was in no way suggesting that Adam and Eve had access to Fritos in the Garden of Eden. "We've gone around and around on the chips issue and we are almost 100% sure that the cave paintings are depicting sun-dried veggie chips that were every bit as good as modern day Fritos." Saah said that the findings show that every time haystacks are enjoyed today, we are "enjoying a taste of Eden." What a fitting name for the GRI spokesperson, “Sal Saah.” Yup, a spoonful of salsa helps the haystack go down. I have heard from credible theologians that haystacks were actually the forbidden fruit that Eve ate, which put us all in a pickle. This article is a bunch of waste material. Corn chips were not invented until Joseph made them from the corn that he stored in the Pyramids. Thus, haystacks are actually an Egyptian food. Sevvy, get your facts straight. P.S. You’ll be shocked to see that I win the Iowa Primary tonight. It’s not over ’till the obese lady sings! Well now, Ben. You might as well give up. Nine percent is nowhere close to winning. Let’s both drop out and endorse Hillary. Dunces at the GRI! That’s old news. Ellen had her vision improved by eating it (she thought of it as manna, kept it secret hidden under a loaf of Graham bread). Where do you think she got the strength to hold up that big Bible? Okay, bugs. Tell me: how do you know she ate haystacks? Were you there? If so, you are a shining example of longevity, like Burny Sanders. Seriously, though, it wasn’t Graham bread, it was Graham pie crust with Little Debbie’s carob filling. I won the Iowa Caucus fair and square. Don’t believe the crooked media when the say Ted Cruz-control won. The media is biased and unreliable. You have to get the facts straight from the horse’s mouth. You just watch and see: I will take the White House by storm. Thanks for your unfailing support. If it doesn’t work out, I’ll just go back to being The Donald and building buildings. And I’ll vote for Hillary. . . . Thanks, Donald. I’ll be sure to attend your 4th wedding. Hey, BA readers-I believe this story of Haystacks in the Garden of Eden. They ate the stuff every day and lived to be well over 900 years. It was even vegan! Think what it would do to us mortals in 2016!! Don’t forget to include the Little Debbies made with the figs of the fig leaf tree. You can”t cover your self with figs. Hence Little Debbie Fig bars & fig newtons. Luv it!! No Woe iz me today. I’m in my own Little Garden of Eatin’ now!! Hey Richard, what are you smoking? Go back to your padded cell and feast on freeze-dried haystacks from the Garden of Eden. And please give my greetings to Adam and Eve. Their names were not really Adam and Eve; that is a mis-translation of the Bible. According to the original Hebrew, their real names were James and Ellen. Donald Tramp a/k/a Donald Dump is a blight upon our society. He should be whipped with a wet noodle. Then he should be deported to Miami. He should be forced to do free labor, building the Great Wall of Mexico along with Sheriff Joe Arpaio of Arizona, a big Trump supporter. They would make a wonderful chain gang. They would look almost as pitiful as the Women’s DUI Chain-Gang that Sheriff Joe initiated this week. All I can say is: it’s time for a woman President (and I’m NOT referring to Carly Fiorina)! Yo, Mr. Donald Tramp, it’s Adam & Steve. I am content in my cell stuffing my innards with delicious Little Bennies, Big Franks and a tofu vanilla milk shake from Trader Joe’s. Recently turned in my Sooper Dooper Power Ball ticket and won a total of $4.00. Yes, I did tithe it. I am truly blessed. Happy Super Bowl “L” to all of youse guys. Woe iz me! !